Reach new heights climbing with Hollingworth Lake Activity Centre or go indoors and visit us at Littleborough Sports Centre or head outside to one of the many spectacular climbing venues that surround us in the Southern Pennines. All of the climbing sessions are provided by qualified staff, who will show you some games and techniques to get you climbing and help your progression. We are also able to provide the necessary safety equipment. Our indoor wall offers a variety of routes and three overhangs to test your skills, located in a sports hall the wall is an ideal place to come down and learn a new activity, meet other climbers and use these skills to take you outside. We are able to offer you both 'have a go' sessions and more structured sessions to develop these skills. We run our own after school climbing sessions designed for juniors who are both beginners and experienced young climbers. Our friendly and experienced instructors use a variety of enjoyable games to teach techniques and skills. These can then lead on to nationally recognised qualifications (see NICAS below). Our relaxed atmosphere provides a more social setting to climb in. Our instructors will be on hand to show you the basics, let you have a go and then go and practice under their supervision. These sessions are very much open to participants who might also want to come down and practice specific techniques on the wall. To book any of the above sessions please contact Littleborough Sports Centre on 01706 927560. NICAS (National Indoor Climbing Award Scheme) is a UK wide accredited and certificated scheme. Starting at age 7, young people can work through levels to start at the basics and work towards becoming an advanced climber. You will work on a range of techniques from rope work to safety checks and communication skills plus a lot more. Level 1+2 Logbook and Certificate's cost £7.50. 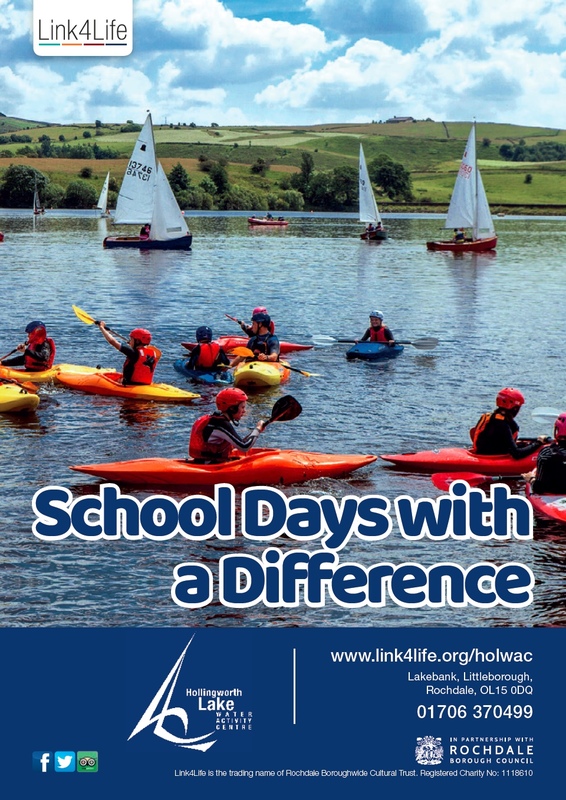 For more information please call us on 01706 370499 or email: holwac@link4life.org. Head outside and see what real rock climbing is all about. Go out with one of our instructors and safety equipment to use all the techniques you know to head up the rock faces. We have quite a few climbing venues around Hollingworth Lake that offer routes to suit all abilities. The gritstone geology that makes up these crags provides a great learning ground for climbers of all abilities to start and hone their techniques, it’s also what many of the famous Manchester Climbers started climbing on. For more information about NICAS and Outdoor Climbing please contact Hollingworth Lake Activity Centre on 01706 370499. Littleborough Sports Centre is ideal for private groups who want to book a dedicated climbing wall they can use and teach on. To book or for more information please call us on 01706 370499 or email: holwac@link4life.org. Whether you’re looking to start out in Climbing or looking for top tips on how to improve, you can book a private lesson for one person or two. To book Indoor Climbing sessions please contact Littleborough Sports Centre on 01706 927560. Reach new heights climbing with Hollingworth Lake Activity Centre or go indoors and visit us at Littleborough Sports Centre or head outside to one of the many spectacular climbing venues that surround us in the Southern Pennines. Check out our Centre Guide and digital Schools Brochure for more information. Click on the links below to view a series of FAQs on a wide range of topics that we get asked here at the Centre. You will need a  day or annual permit which can be bought at Reception. We will need to see 3rd party insurance. Some National Governing Bodies like the Royal Yachting Association and British Canoeing will provide it but please check with them directly, this is up to you to check. Indoor climbing sessions are available under the direction of qualified and experienced instructors from Hollingworth Lake Water Activity Centre. To book please contact Littleborough Sports Centre on 01706 927560. For details of these and other outdoor activity sessions visit www.link4life.org/holwac. [page_description] => Link4Life is a charity that works in the heart of the Rochdale Borough community, inspiring people to live more active, creative and healthy lifestyles. We connect people with their cultural heritage, encourage creativity and foster well-being for each and every member of our diverse community. [description] => Link4Life is a charity that works in the heart of the Rochdale Borough community, inspiring people to live more active, creative and healthy lifestyles. We connect people with their cultural heritage, encourage creativity and foster well-being for each and every member of our diverse community.